in Mt. Laurel, NJ, has been nominated for America’s Favorite Vet. She’s the only vet from New Jersey, and I’m hoping to help her bring the title home! The winner becomes the spokesperson on behalf of the American Veterinary Medical Foundation, AVMF, which is the charitable arm of the American Veterinary Medical Association, AVMA. This is not a paid position! And there is not a vet I know more qualified and dedicated, and would wholeheartedly represent the betterment of care for animals, promote advocacy, and inspire fundraising more than Dr. Lisa Aumiller! She is a mobile vet and is known for visiting sick pets past 11 pm, starting her schedule earlier than planned, and arriving in the worst snowstorms to make sure her patients are seen. Additionally, Dr. Lisa has two hospital facilities if parents prefer to bring their pets for traditional vet visits. Her practice focuses on integrative care and wellness, and with the latest technology, she is able to perform cold laser therapy, acupuncture, x-rays, ultrasound, and the like, for pets in the comfort of their own homes! She is also most charitable and benevolent with providing medical care to animals, working with over 40 rescues, and is so extremely giving of her time with outreach, raising awareness about wellness and nutrition, holding complimentary educational seminars for pet parents, pet sitters and professionals, free dental screenings and wellness events for pets in the community, and workshops for children. She held a Martin Luther King, Jr. community service project bringing everyone together to bake healthy treats for homeless animals and a workshop making environmentally-friendly toys to donate to animals in shelters, and continuously sponsors similar events. She brings live animals and education to children at schools, teaching respect and proper care of animals, provides extensive, complimentary medical care for animals in a makeover project for homeless dogs in a collaborative effort with groomers to facilitate adoptions, and does microchipping for donations, while the community chooses a different nonprofit charity to receive the donations each month. And for years, Dr. Lisa has been writing an informative column for the county newspaper and answering parents’ questions. Dr. Lisa’s positive and upbeat personality inspires the community to volunteer; families come together for fun days, pets are welcome and spend quality time with their parents, and everyone enjoys fundraising endeavors! She’s currently sponsoring events to bring the first local dog park to Riverton, NJ, and strongly encourages pet-friendly social activities by hosting doggie dips for furry babies to enjoy a swim, Yappy Hours sipping Puptinis, and Pup and Me Yoga! 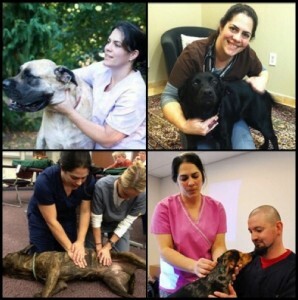 With her down-to-earth personality and philosophy of teamwork, you get to engage with Dr. Lisa and the incredibly friendly staff at HousePaws at the various events, not only when your pet is ill, so you connect on a personal level, feel much more comfortable and truly cared about in time of need! Year round Dr. Lisa and HousePaws Mobile Veterinary Service raise a tremendous amount of money for The Boo Tiki Fund, a non-profit charity where parents may apply for a grant for veterinary care to avoid having to put their beloved pet to sleep, to end suffering by improving their quality of life, even preventing a pet being relinquished to a shelter because a family cannot afford medical care. And that’s even just a portion of what I’m aware! My personal experience with Dr. Lisa Aumiller is that she never says no!!! Her practice has been the main sponsor for South Jersey’s Annual Pet Wellness Symposium I organize and host, and she immediately said yes when asked if she was interested in becoming the certified vet for trainings when a Fido Bag is donated, another voluntary position! For the past few years, Dr. Lisa has been providing first responders the necessary training to utilize pet-specific oxygen masks and Animal CPR / first aid so animals now have a chance to survive a fire or disaster. I’ve also brought her animals from the street when other vets recommended euthanasia and she provided life-saving surgery, knowing I hadn’t even begun to raise donations yet. Another animal I literally took from a cage at another vet’s office who they scheduled to be euthanized! Dr. Lisa allowed him to live at her hospital until I found a home. And who do you think took care of him on the weekends and evenings when the staff were off? That’s right, Dr. Lisa Aumiller herself! I’ve emailed, texted, called Dr. Lisa countless occasions regarding my personal pet as well as pets in my care in the evening, weekends, holidays, and she always took the time to answer my questions and ensure the pets received appropriate care. I thank her every opportunity I get for always taking the time to help because not only did it benefit the animals in my care, but Dr. Lisa helped me to become a more educated and skilled pet sitter! Too good to be true, right? That’s what I thought when I first met her… But it continued and just gets better and better; hence, her earning the title of a “Veterinary Angel” with me as well as so many others! Although you may not live in New Jersey, I highly recommend you vote for Dr. Lisa as there is no doubt she will inspire other vets and set a precedence that being a veterinarian doesn’t stop at treating animals… it’s just the beginning! Animals desperately need Dr. Lisa Aumiller’s voice as the AVMF’s spokesperson; she needs your vote to make it happen. Again this is not a paid position, rather, an extension of a vet’s dedication to outreach and education! Click here for the ballot to vote… vote for Dr. Lisa Aumiller. You may vote daily until Tuesday, Sept. 1st. Animals need Dr. Lisa and HousePaws Mobile Vet… and she needs your votes to win!! !